A dental crown (formerly known as a cap), is a full coverage restoration. Like a helmet that goes over your head, a crown covers the entire visible surface of the tooth. It looks like a brand new tooth. As we age, many of us find ourselves with teeth that are not structurally sound. Grinding or clenching our teeth, an improper bite, age, fillings, root canal, and tooth decay can all be contributing factors in wearing down and cracking or breaking teeth. Genetically defective and mal-positioned teeth can also benefit from restoring with dental crowns. Dental crowns can add strength, durability, and stability to affected teeth and in many cases can restore, straighten, and enhance a beautiful smile. A dental bridge is a “fixed” restoration, replacing one or more teeth. It literally “bridges across the spaces created by missing teeth. The teeth on either side of the space are the anchors for the “bridge”. 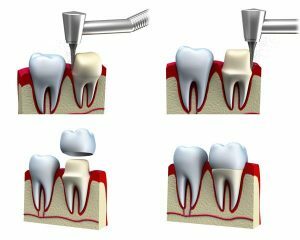 A dental bridge is a false tooth, known as the pontic, which is fused between two porcelain crowns to fill in the area left by a missing tooth. 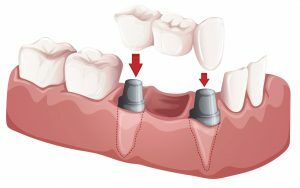 A “fixed” dental bridge can’t be taken in and out of the mouth like a removable denture can. It is considered “permanent” although their lifespan varies. Bridges can help to correct some bite issues, improve speech and can restore and enhance a beautiful smile.